Qingdao in East China's Shandong province is drawing worldwide attention, thanks to its hosting of the summit of the world's most populous regional organization. The 18th Shanghai Cooperation Organization Summit is taking place in the coastal city from Saturday to Sunday. The SCO currently has eight member states, four observer countries and six dialogue partners. Created in 2001, it has become a comprehensive regional organization and has begun to play a more active role in regional and international affairs. The two-day summit is the second highest-level international event the city has ever hosted, after the sailing events of the 2008 Beijing Olympic Games. The summit was previously held in China three times, twice in Shanghai and once in Beijing. Qingdao is the third host city. Sun Zhuangzhi, secretary-general of the SCO Research Center affiliated with the Chinese Academy of Social Sciences, said that the selection of Qingdao as the host city reflects China's efforts in promoting the Belt and Road Initiative. Qingdao has both land connections with Europe via railways and maritime connections with many seaports across the world, he said, adding that the city has played an important role in developing the initiative. In 2013, China proposed constructing the Silk Road Economic Belt and the 21st Century Maritime Silk Road, which received wide attention and positive responses from the international community. Qingdao was designated as a hub of the New Eurasian Continental Bridge Economic Corridor and a strategic city for maritime cooperation during the implementation of the initiative. Over the past five years, the city has comprehensively and deeply combined its development with the Belt and Road Initiative. To date, it has 70 sister cities around the world and has established trading partnerships with 215 countries and regions. The city's companies have invested in 1,542 projects in 99 countries and regions, with a total investment of $29.55 billion. Last year, the import and export volume between Qingdao and countries involved in the Belt and Road Initiative reached 248.53 billion yuan ($38.76 billion), an increase of 11.2 percent year-on-year. Of that, exports amounted to 160.11 billion yuan, up 6.8 percent, and imports grew by 20.1 percent to hit 88.42 billion yuan. The ongoing summit will not only help Qingdao to improve its international status and boost the development of the tourism and exhibition industries, but also help improve the city's infrastructure and public facilities, local officials said. The city government has conducted a three-year campaign since July last year to improve the urban environment and management by taking into consideration both the summit's needs and people's needs for better lives. Changes have taken place within a year, with the city's night appearance becoming more beautiful and road network having been renovated. In recent years, the city has attracted an increasing number of high-profile international conferences, forums and expositions, such as the World Horticultural Exhibition in 2014, the 2017 China Wealth Forum and the 2014 APEC Second Senior Officials' Meeting and Meeting for Ministers Responsible for Trade. 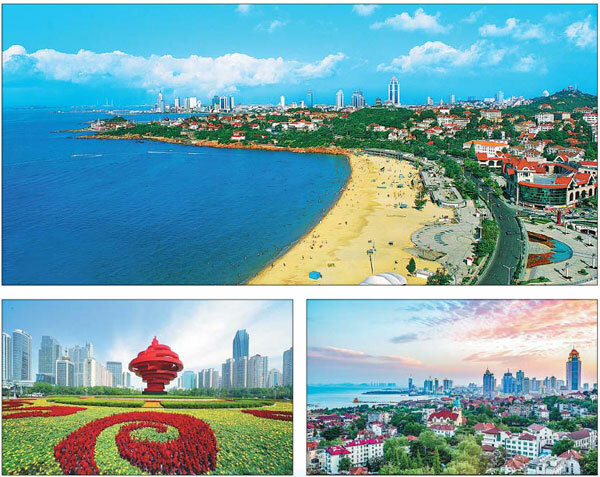 Endowed with a pleasant climate, wonderful landscape and beautiful ocean, Qingdao has been selected by the United Nations as one of the best cities for human habitation. It is also an important city on China's coast, as well as a popular tourism destination, a historical and cultural city and an international port city. "Qingdao has made great achievements in promoting economic and social development during 40 years of reform and opening-up," said Zhang Jiangting, the city's Party chief. "It has now grown into a vibrant, fashionable and attractive international metropolis, and will show its unique city charm and image to the world through the summit," Zhang added. Qingdao has renovated some of its ancient buildings to showcase contemporary arts. It is also the birthplace of many "firsts" in China - the first road, the first train and first bottle of mineral water. The ocean is the most distinctive feature of the city. Qingdao a total sea area of more than 12,000 square kilometers and a coastline stretching 817 kilometers. The city has 69 islands and 49 natural harbors. It also boasts about 20 percent of all the maritime-related research institutes in China, as well as one third of the maritime-related research and development platforms at ministerial level or above, and 27.7 percent of maritime-related academicians at the Chinese Academy of Sciences and the Chinese Academy of Engineering.